One of the coolest things about brands is how they serve as symbolic devices. This is nothing new and it makes intuitive sense. If you see a guy driving around on a Harley, you'll likely connect the dots that he has a little bit of "freedom" and "rebellion" and in him. See a girl wearing Lululemon tights, you'll likely assume she is into health and exercise, and is seeking some balance in life. A lot of research has been done on this topic and authors like John Quelch have written very eloquently on how some brands (e.g. McDonald's and Coke) even serve as globalization/Americana symbols on the geo-political stage. Combatting Coke and Pepsi's Americana is actually the raison d'etre of French-based competitor Mecca Cola. Several years ago, a buddy of mine told me the story of the symbolism of 3 car brands. Since I couldn't find this story anywhere on the net, I decided to post it here so that it can immortalized on the Net- or at least on the MackalskionMarketing blog! BMW- "I play the game well." Mercedes - "I've mastered the game." Rolls Royce- "I've made the rules of the game." "I play the game well" - "I've mastered the game" - "I made the rules of the game"
Both options looked pretty similar to me- nice bulbs in a mesh packaging. One had 3 bulbs in it, the other 5. The 3 bulb (115g) option however, was $4.99. The 5 bulb offering looked a touch whiter and was only $1.29. Given the low involvement nature of this purchase, I instinctively selected the $1.29 pack. After all, garlic is garlic, right? And whiter is better too, right? But, in the produce section, I paused for a minute. The big price gap had gotten the better of me so I had to go back to check the labels more carefully. Closer inspection of the labels revealed different countries-of-origin. 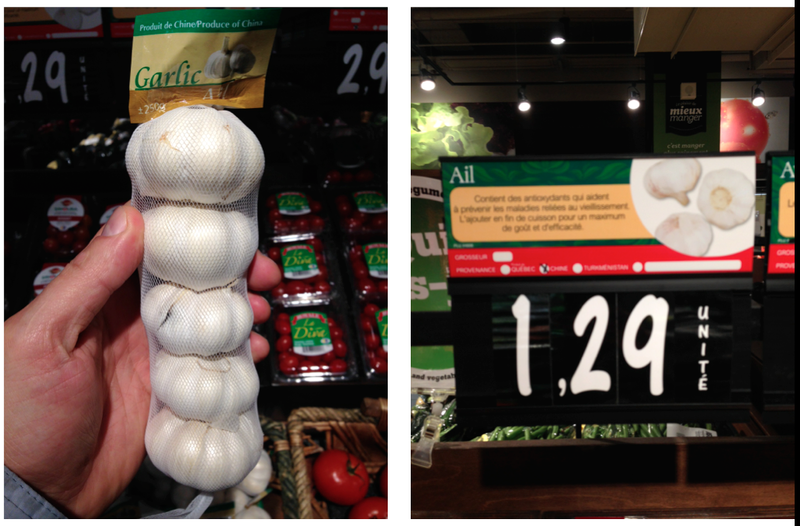 The $1.29 garlic was produced in China; the $4.99 pack was grown locally. 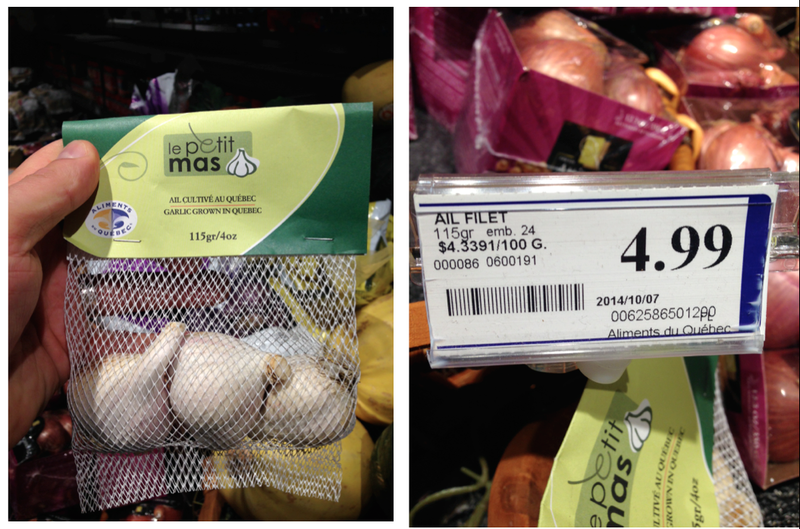 On a per gram basis, the Canadian grown garlic is 10 times as expensive as the Chinese competitor. Chinese country-of-origin plays a positive role for a bunch of product categories- from jade to alternative medicines; from fireworks to efficient production processes. Chinese country of origin is a detriment to food, however. For many consumers, China is a real downer when it comes to food safety. The country suffers from food safety scandals, lax regulations, and questionable labelling. I didn't want to eat something bad, so I did a quick Google search to check on how the Chinese garlic industry was doing. The first report I saw was from a 10 year veteran of the garlic space. She wrote of her visits to Chinese farms and described uninspected farms, abusive child labor practices, intentionally mislabeled boxes (e.g. Product of Uzbekistan to bypass US Department of Commerce anti-dumping duty assessed on garlic produced in China), and garlic "cleansing" in cloudy sulfite solutions to give the garlic a bright white hue (so it looks good for international purchasers). This reinforced the worst of food production of "Made in China". Needless to say, I purchased the good ol' made-in Canada garlic. I didn't mind paying 10 times the price. If I were the local grower of any Canadian made veggie or fruit that was competing with Chinese produce, I would make damn good and sure that I was emphasizing my Canadian country of origin.